We have designed a specialized lightweight, low-power and highly sensitive marine induction coil magnetometer and amplifier system. The picture below shows several coils during construction. 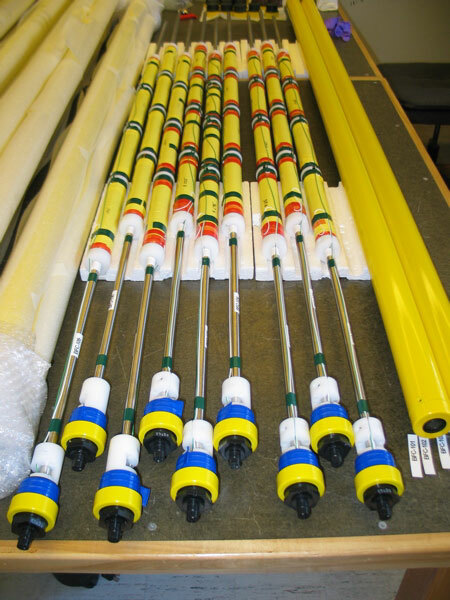 The long highly permeable magnetic bar collects the nearby magnetic field into the bar, increasing the flux passing through the several thousand turns of wire contained in the yellow bobbins. The voltage induced in the wire turns is then amplified using a low noise chopper amplifier similar to that used for seafloor electric field measurement. The assembly is housed in a 6 foot long 7075-T6 aluminum pressure case that is anodized and painted to resist corrosion by seawater and terminated by two end caps sealed with O-rings, enabling deployments to about 7000 meters deep.